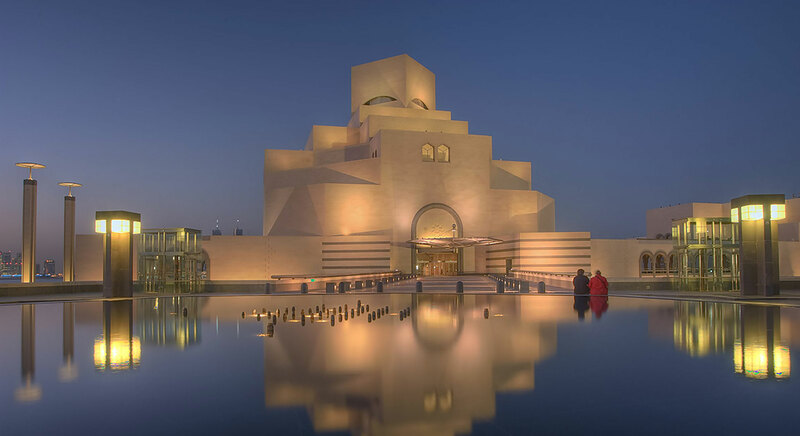 Unlike much new construction in the Middle East, this building is uncluttered and spacious, and is filled with references to the Islamic world’s architectural heritage. Approached by a bridge under which a riyad, or artificial stream, flows, the museum is set on a man-made island and distorts the sense of perspective, seeming smaller from the shore than it is. Pedestrians ascend between double rows of palms on either side of the roadway, while a watercourse divides the driving lanes. The interior recalls the cascading spatial organization of great Islamic mosques. The space induces the visitor to look up upon entering and downward from every balcony. Ceilings could not be uplighted, nor could any light source be glaring. A very large number of small low brightness downlights were integrated into the poured-in-place architectural concrete ceilings and all lighting and wiring contained in these surfaces had to be integrated. The dome is daylighted by an oculus at the apex, and an invisible clerestory around the bottom.